Bible Cartoons: John 12 - Jesus anointed at Bethany - who’s who?! John 12 - Jesus anointed at Bethany - who’s who?! Below is the cartoon which shows Jesus feet being anointed with oil, which is found in John’s gospel, chapter 12. I spent quite some time creating character sheets for each of the disciples, so that I could consistently draw each one & differentiate them all. So that my viewers know who is who, here is the cartoon with labels. 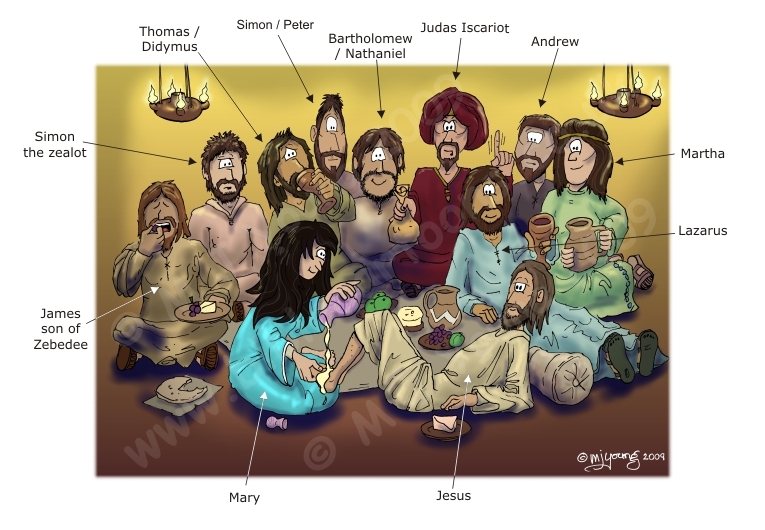 Click here to see the John 19 – Jesus anointed at Bethany Bible Cartoon, with notes & purchase options. Click here to see the whole of John’s gospel Bible Cartoon set.